Developed specially for the US Military but now available in the UK! Never bull your toe caps again with Shape Up Instant. 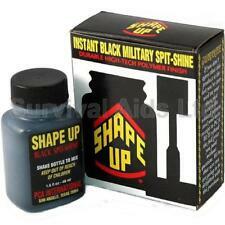 Shape Up gives a long lasting, mirror-like finish to your black parade shoes or boots. The plastic polymer finish won't crack or peel and does not require rubbing or brushing. Simple to apply, dries in minutes. Unlike lacquer finishes, Shape Up doesn't damage leather and can be easily removed using a soft cloth with either methylated spirit or an acetone-based spirit (e.g. nail varnish remover). Size: supplied in 48 ml bottle with applicator. Colour: black. For all kinds of leather, suede, nubuck and textile materials in the HIGH-TECH branch. Materials stay breathable and, when regularly used, their surface stays like new for longer. Ted Baker: Brown Brogue Shoe Shine Kit. Would made a great washbag too. SAPHIR POLISH AND BOTH DRAW STRING BAG AND POLISH CLOTH AS SHOWN IN THE PICTURE. Made with natural waxes and oils, such as Pure Australian Beeswax, Pure Carnauba wax, Sweet almond oil, Jojoba wax and much more.BLACK PREMIUM LEATHER CONDITIONER - Made to condition black or near black leather, It is not a colour and will not colour your leather. 85ml bottle. Tent Electrics. Military Clothing. Trestle Tables. Sleeping Bags. Camping Toilets. Caravan Awnings. Dry cleaning kit. boot and shoe refresher. new and unused. boot sauce conditioner. WFS Genuine Horse Hair Shoe Polish Brush. Limited edition 15cm dark bristle, wooden handle brush. Waterproofing Thornproof Dressing. Barbour Restoring Wax. for Clothing & Jackets. Use on all smooth leather, Clothing, shoes, furniture, saddles, bridals and much more. We are Proudly Australian Made and use only the best and highest natural ingredients. FraPete never compromises on quality. 2 x WFS Genuine Horse Hair Shoe Polish Brush. Limited edition 15cm dark bristle, wooden handle brush. The high-quality Effax products care for leather whilst cleaning and protecting it against water and dirt. The polishing cloths give a leather a glossy shine. Effax® Leather-Care-Case. Effax Leather-Combi 50 ml. About Kingpin : Kingpin represents the best in Skateboarding. From footwear to hard goods Kingpin has you covered. Crep protect developed a range of shoe-care products to help keep your trainers looking fresher for longer. Their products are easy to use and will help give your shoes the premium care they need. Safe to use on all shoe materials. Shake the bottle before use. Soak cotton wool with the stain remover and wipe the stain lightly. Stain remover for Biro pen SAPHIR-AVEL WBIRO neutral for Skin. Stain remover for inks, effective on a variety of smooth skin. 2 FraPete leather cream conditioners at a wholesale price and save. Get one for yourself and anither as a gift. FraPete Natural leather conditioner lasts and lasts. The FraPete leather conditioner is designed to keep your leather in tip-top shape and bring back old and abused leather back to life. Contains 2 polish, 2 buff clothes, 2 brushes. luxury shoe polish kit. Crep Protect present the Rain and Stain Shoe Care Spray, versatile shoe protection that covers your shoes in an invisible, optically clear protective barrier, beading liquids to reduce stain and dirt deposits whatever the style. Treat with Effax Leather Balm or Effax Leather Oil. EFFAX LEATHER COMBI 500ml. EFFAX LEATHER BALM 500g. Leaves the leather with a brilliant shine. Combination of lanolin and avocado oil. Bank Deposits – Bank details will show at checkout. Waproo 9 Piece Deluxe. 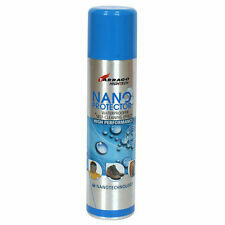 Waproo Leather Care Products. Ideal for travelling or as a gift. Applicator Brush– Black. Applicator Brush– Neutral. Plastic shoe horn. Natural Polish brush – Black. Natural Polish brush – Neutral. Schon haben Sie einen praktischen Dosierer, damit Ihre Mannschaft und Kollegen die Haix Schuhe effektiv pflegen können. Entdecken Sie die qualitativ hochwertigen Produkte von Haix - vom einfachen Schuhanzieher bis zum modernen Feuerwehrstiefel. Cerruti brand new black designer 4 piece shoe care kit. high quality, comprises of black shoe polish shoe horn, polishing cloth, polishing brush. brand new genuine product. TRG SUPER COLOUR AEROSOL 400ML White. not use green fibre. Leather & Vinyl Dye Similar To Magix Dye. Allow to dry. It is essential to clean thoroughly and remove old finishes prior to application. Prym Press fasteners 390211 button with screw for Tents and Caravan Yacht. Automatic stainless steel fasteners for wall tents or camping-cars and boats. Tipo Yacht e Caravan. art. 390211.